Firstly, I wanted to say thank you. To all of those who know that i’ve been really rather sick recently, thank you so much for the kind words and messages and shows of love. I’ve always said the blogging community was exactly that, a community of like-minded virtual (and real-life) friends who really do rally together when needed. From the cards and calls to the most simple of messages on a Facebook feed, you have no idea how humbling and supportive it makes you feel. On those long, drawn-out days and sleepless nights lying in a hospital bed, it truly lifts the spirits. Thank-you. Many people still find it hard to believe that I share my birthday with The Viking but it’s true. September 24th is the date of our birth. When we first met it was one of those ‘when’s your birthday… no that’s MY birthday’ moments but the novelty soon wore off. You see The Viking is not a fan of birthdays. This is something i’ve never quite embraced as a concept simply because I’ve always enjoyed my birthdays and the idea that I was with someone who wasn’t meant I had to mentally deal with the negative impact of that remains something we simply place in a dusty cupboard somewhere. I mean of course I totally get it really. When he grew up his family simply didn’t make a fuss (it was all very stoical and northern…) and by the time he left home and went to collage it just wasn’t a big thing, then when he started promoting clubs in London his birthday was always used as an excuse for celebration and so the day became about work rather than fun. So this so-called spacial day has never really been that special for him. We also work in a very youth-biased industry and every year older marks another year where, once you reach a certain age, your opinions and ideas become more and more invisible. I see this happen on a daily basis as I meet clients who are young enough to be my kids. I have the arrogance to know that my work and worth is still valid but our society continues to feed off the youth and with each passing year it becomes harder to bother. Don’t get me wrong, we’ve had some very fun birthdays over the years and he does make an effort for me but they’ve become much more of a simple day of reflection and homely celebration rather than boozy nights and hungover mornings. Of course this year has been especially poignant for me with my recent sojourn in hospital I have spent the past few weeks reflecting on my life, my future and my plans for recovery. Each day brings us a new set of unforeseen challenges and i’m currently focussing on listening to my body and slowly coming back to the life I want. Going home back to the cottage was my first big hurdle. I was desperate to get out of hospital and I’m lucky enough that my mum is here to care for me, so I convalesced at her home for a few days, (and very spoilt I was too!) but as many of you know we have one of those complicated lives where we work in one place and have a home in another and so it wasn’t until last weekend, a full month after I was first admitted to hospital, that finally managed to get back to my true home. And we had a lovely weekend. Visits from friends, plenty of cards to open and lots of good homemade, healthy food… and I even baked a birthday cake. So I wanted to bake a simple ‘Victoria Sponge’ style cake that I could do in my stand mixer so as not to overexert myself. I think my favourite type of cake is a simple cake but i added some of my favourite ingredients to the cake mix to make it all go a little further so the sponge also includes ground almonds and yoghurt which kept the cake gloriously moist. 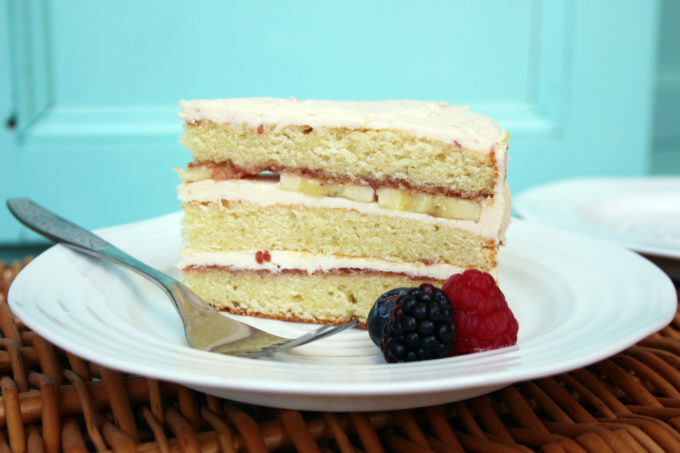 A simple jam layer between the sponges and then a layer of sliced bananas too. There’s something about bananas that cut through any cloying sweetness that I don’t like about cakes, plus they go so well with strawberry jam, it’s simply a favourite, unexpected surprise. The stunning but simple blackcurrant jam buttercream frosting was inspired by this recipe on Supergolden Bakes. It’s a stunner and will be used again many times. (I used shop-bought strawberry jam but it was still epic.) Thank you to Lucy for being such a sweetheart. I’m using my smeg stand-mixer with paddle blade but it can all be done either by hand with a wooden spoon or using a hand-held mixer with double whisk attachments. 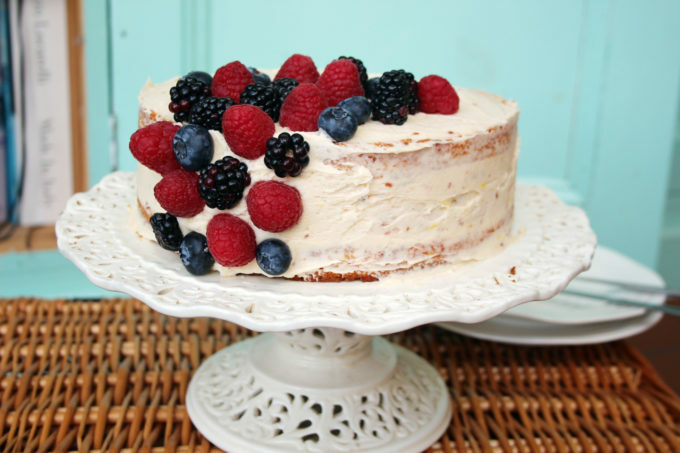 assemble the cake with the first sponge layer on the bottom of the cake stand, with a light layer of jam spread over the top followed by a thin layer of buttercream. On the next layer, repeat and then add the sliced banana. 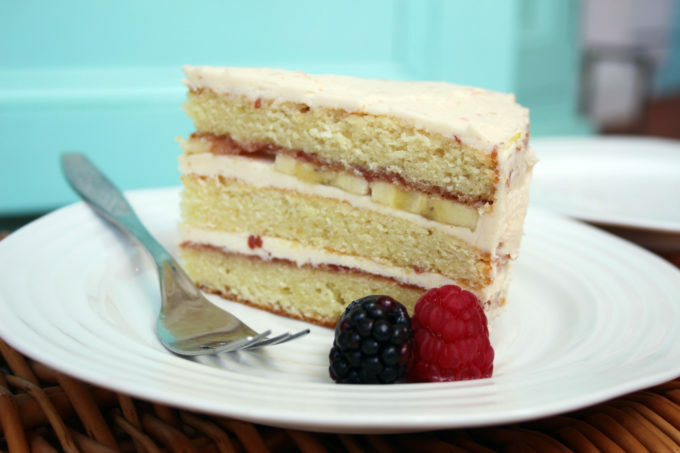 For the top layer, I spread a thin layer of jam on the underside of the top layer before placing it onto the cake… then simply lay and cover as much buttercream on top of the cake as you desire. I’ve gone for this unfinished ‘naked’ cake look as I like the aesthetic and it’s not as rich as it could have been had it been fully slathered! I then decorated with a fancy asymmetric fruit splurge… which looks kinda pretty. PS I know exactly what you mean about the young and about birthdays. I have been invisible for years but it does come in handy at times. As for birthdays, “reflection and homely celebration” is just right. Hangovers are overrated. So happy that you’re home and mending! Happiest Birthday, old blogging friend ! Sorry to hear you’ve been unwell, hope you continue to make a full recovery. At least you don’t need to say that you have to make your own birthday cake – you’re baking for someone else, really! Thanks Suelle, it’s been an odd time but i’m on the way to recovery! Really sorry to hear your bad news and I don’t mean the year older bit. I’m wishing you a fast and complete recovery. As for birthdays, I’ve never been all that excited by those but I am excited by cake. 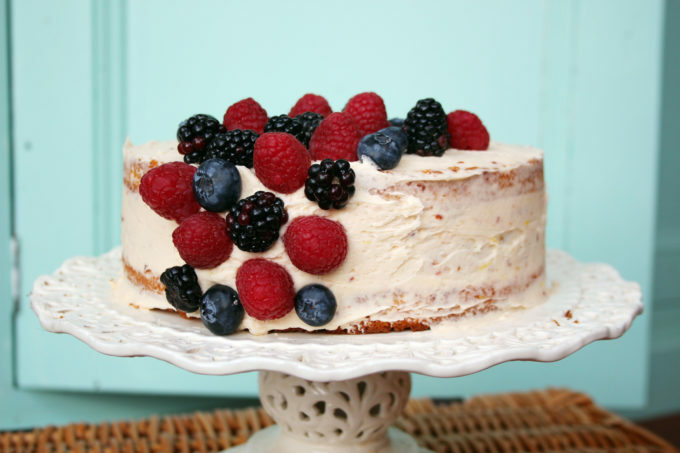 You’ve got to be recovering pretty well to make a cake that good. Take it easy and look after yourself really well.